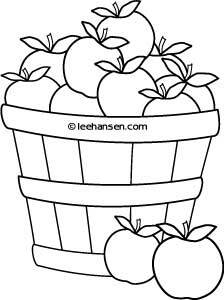 Basket of Apples coloring page - print and color a picture of apples in a farm basket. Apple Basket Coloring Sheet - Click image or link to open full size farm stand basket of apples coloring page. Copyright info will not appear over the picture on the printable (Adobe PDF) sheet.